Microfiber cloth safely removes smudges from lenses and screens. 6" x 6" cloth stuffs inside attached neoprene pouch so it stays clean from dust and debris. A snap hook lets you clip it where you want it for easy access and to prevent loss. Made in USA. Machine washable. Assorted patterns with The Fly Fishing Shop's signature logo. 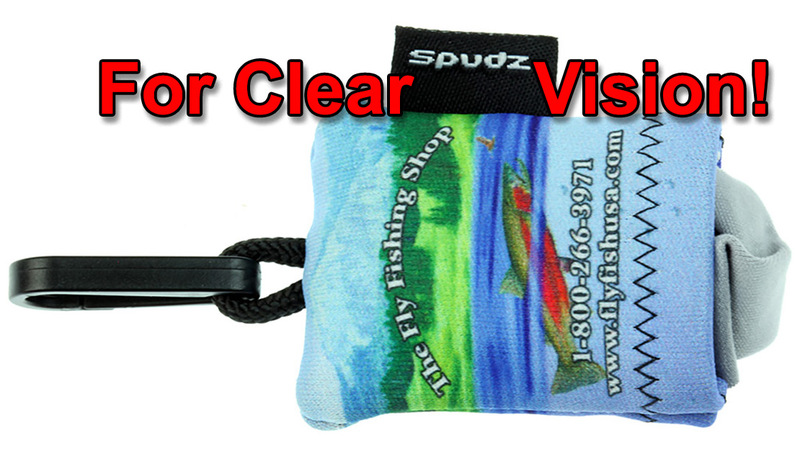 Spudz microfiber lens cloths offer a simple solution to a universal problem; dirt and smudges on glasses and other optics. Spudz clean your lenses without damaging or scratching them, making them invaluable as an accessory. This convenient product clips to zippers, key chains, bags, or any number of other locations. It is washable and reusable making it environmentally friendly. The cleaning cloth stays attached to the neoprene pouch that holds the cloth when not in use. Just tuck the cloth into the pouch when you are finished with it, and clip it where you want it.